The new GrayMatterTM (ToyDirectory,ToyShow) board game dares players to question their own knowledge of trivia. A series of fun and engaging trivia questions provide a choice of potential answers that empowers players of all ages to think, discuss and choose. 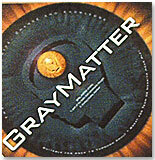 Great for family gatherings, parties or any other social occasion, GrayMatter’s singular appeal seems to be the way it delivers entertainment and variety in a simple and easy to understand format.